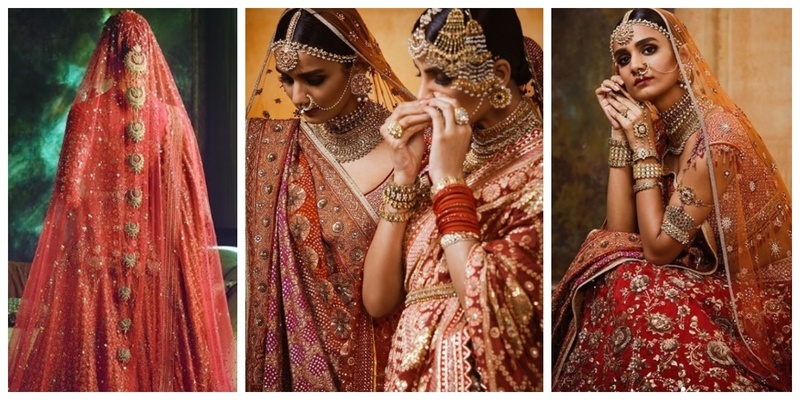 Tarun Tahiliani just dropped a bomb on Instagram with his latest Bridal Collection! Tarun Tahiliani just dropped a sneak peak of his new bridal collection ‘In Elysium’ on Instagram and it's no less than a bomb! This wedding collection is not just out of the world gorgeous but also sings the classic tale of the handcrafted heritage of India. 1. Gorgeous red lehenga with the dupatta embedded with Mughal chaands! This represents one of the finest, hand crafted bridal ensembles and yet, for all its encrusted opulence, has a lightness and an ethereal quality. A Mughalesque jaada in handcrafted zardozi with tiny sew on Swarovski gold crystals give way to a trail of Mughal chaands (crescent moon). Approximately after thirty thousand hours of work, countless crystals are then framed by silk dupion border in gilded metal tones. The bodice is crafted in a stretch Italian hand dyed tulle, and the dupatta is embroidered on a brocade bandhini that is encrusted later. The significant detail lies in the panelled veil which has three dimensional flowers and the illusion of a chaand choti. 2. Swarovski embedded heavily embellished red bridal ensemble! Featuring swarovski embedded heavy zardosi work on the lehenga, and an equally heavily embellished brocade dupatta, this lehenga brings out the classic Indian bride in you. Paired with another subtle net dupatta and beautiful bridal jewellery, this trousseau has a beauty beyond words! The silver oxidised jewellery with intricate Kundan work in it completes the look of a traditional royal bride in the perfect way! 3. Mughal era inspired Banarasi bridal lehenga! Vibrant shades of vermillion and marigold are anchored with a traditional floral border. The fitted Mughal silhouette of this Benarasi bridal ensemble is accentuated with zardozi and resham silk hand-embroidery and a gorgeous veil of Italian tulle. 4. Tarun Tahiliani’s tea-rose Sherwani! Born out of ethereal lightness, seamless constructions of fit and fall are translated throughout the line of Tarun Tahiliani's hand-embroidered couture for men. A fitted cummerband accentuates the opulence of this tea rose sherwani, while a contrasting detail of deep peach adds a vibrant burst of auspicious colour. An eye for perfection paves the way for sublime decadence, bringing finesse to this exquisite ensembles for brides and grooms by designer Tarun Tahiliani. The paradise of Elysium is recreated with every weave, giving a new voice to traditions. 5. Bridal ensemble in pastel blues and lilacs! In an everlasting quest for lightness and ease, this lehenga comes in the most muted Mughal pale blues and lilacs, mixed with traditional zardozi. It has the classic Swarovski pave in tones of opal, pacific opal, chrysolite and cyclamen. Muted, sophisticated and India modern! The hand dyed veil in the tulle has a 3D life through the flowers and subtle florals for a dream bridal. The video sings the classic saga of this beautiful pastel ensemble. 6. Blush bridal ensemble with resham silk thread work! Capturing the essence of an ethereal garden, this blush bridal ensemble renders a lightness through intricate zardozi, resham silk thread-work and hand-crafted Swarovski crystals, pearls and shimmering beads. 3D gota-patti florals elegantly lace the Italian tulle edges of this dynamic lehenga. 7. Cream and gold ensemble with pearl detailing! Seamless constructions of fit and fall and thread embroidery with pearl detailing can be seen in this bespoke cream and gold ensemble. A sleeveless sherwani paired with a silk kurta and dhoti elevates sartorial skill for the quintessential Tarun Tahiliani groom. 8. Asymmetrically patterned pastel pink floral lehenga! The decadent lightness of every drape is the embodiment of a new voice of tradition. An ivory tulle veil with patterned starlight florals sits over a pearl and crystal blouse, paired with an asymmetrically patterned floral lehenga. Our eye for perfection paves the way for sublime decadence, bringing finesse to our exquisite ensembles for brides and grooms. The paradise of Elysium is recreated with every weave, giving a new voice to traditions. Going gaga over this jewellery collection from Shri Paramani Jewels. It has the perfect blend of the traditional trends with a subtle modern touch. For brides who love to go all out on their wedding day! Loved the choice of such vibrant traditional jewelleries for these heavy bridal ensembles. P.S.- The double paasa look of this bride has a beauty beyond words! For a bride who prefers the minimal diva look, Tarun Tahiliani features a gorgeous bridal lehenga in pastel shades. The ensemble is paired with beautiful minimal jewellery that compliments this look with perfection! The entire collection features ensembles of unspokable grace! So which look did you prefer?